The RDTA designed specifically for clapton coils. 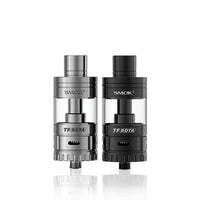 The TF-RDTA by Smok was crafted with juice wells to keep up with the demand of high performance vaping. The TF-RDTA features wide slots for airflow intake to cool of your wicks and produce fantastic clouds. TF-RDTA - Smok has a rating of 4.8 stars based on 4 reviews.